ESCHATOLOGIA: Did Kosmas the Aitolos Say "Curse the Pope" and "The Pope is the Antichrist"? However, when Fr. Irenaios read this passage, it made him question from whence it came, and therefore he looked for the earliest evidence for the phrase "Curse the Pope." He saw it in 2001 in the conservative periodical Orthodoxos Typos, but due to circumstances he was not able to cut out the article. Then he saw an article in another periodical, Ta Niata, in which John Menounos sent letters there and who had done his doctoral thesis on St. Kosmas the Aitolos. Fr. Irenaios determined therefore in 2009 to write him through the periodical and ask him about the phrase. Menounos responded that he knew nothing about it, and that it was probably added into the text by the conservative Kantiotis in his book (though in fact it first seems to appear in the writings of Yannis Makriyiannis in the mid-19th century, in which he attributes the saying to St. Kosmas). With this Fr. Irenaios understood that this was something to look into. Fr. Irenaios therefore examined the texts of the homilies of St. Kosmas as they were published by both Kantiotis and Menounos, and he discovered without a doubt that the phrase "The Pope is the Antichrist" was an interpolation into the original text. John Menounos doesn't even include the two homilies that speak of the Antichrist in his thesis, despite the fact that he published a critical edition of the manuscripts. Kantiotis did include these two homilies. One of these homilies is what is known as "The Sixth Teaching," which states: "And again searching in the holy Scriptures, I find that Prophet Elias and the Antichrist have come - the latter we have on our heads and I don't have to tell you who he is, for you know him. And now we no longer expect either the Prophet Elias nor the Antichrist." Fr. 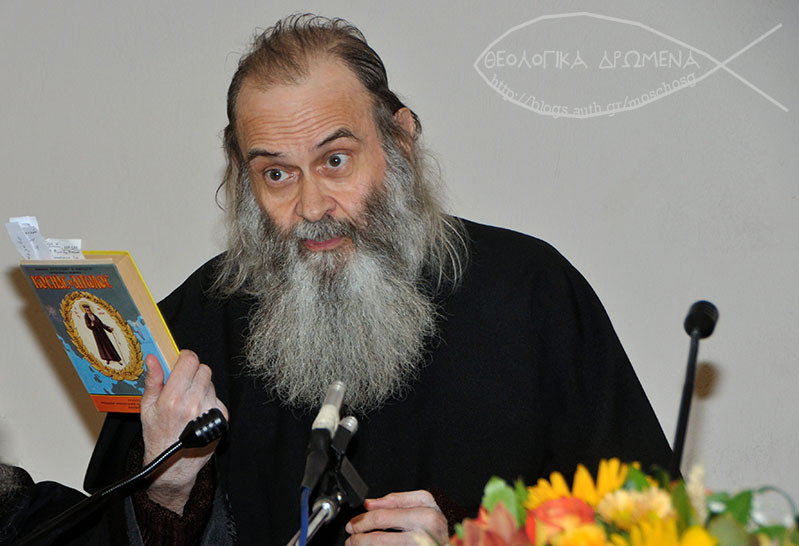 Irenaios says that this homily comes from only one manuscript, which was written in 1808 by Demetrios Chrestos, who was held in a dungeon in Gjirokaster, Albania on behalf of his Christian faith. Another homily, "The Eighth Teaching," was delivered by St. Kosmas in Kalambaka in 1774. In 1774 it was given by a priest named Stamos. We do not have the original manuscript, but a copy in a book on hagiography from 1824 which is in the Central Library of Thessaloniki. In this manuscript it says: "And by examining, my brethren, and searching the Scriptures and the holy Gospel, we find that prophet Elias has come and that the Antichrist has come and has put prophet Elias to death, and now we wait for neither the prophet Elias nor the Antichrist. The Antichrists are: one, the pope, and the other one, the one who stands over our heads. You understand whom I mean without my saying so. It is sad for me to say this to you, but these Antichrists are lost as they stand now." Therefore, while St. Kosmas elsewhere talks about the Antichrist, in this manuscript it speaks of two Antichrists. And while the 1808 copy doesn't name who the Antichrist is, the 1824 copy identifies one of the Antichrists as the Pope. How did this happen? It appears that this interpolation came from an Athonite monk known as Theodoret of Ioannina, who claimed that St. Kosmas allegedly prophesied that he would become the abbot of Esphigmenou Monastery. Theodoret is known for making sixteen heretical forgeries in the Rudder of St. Nikodemos the Hagiorite, as he was entrusted with its initial publication, which brought St. Nikodemos much distress, and caused the Ecumenical Patriarchate to issue encyclicals of warning about these interpolations, ordering to "cross them off with ink." This same Theodoret authored a book on eschatology titled Interpretation of the Apocalypse. And in this book he talks about two Antichrists, one who was the Pope and the other who was Muhammad or Islam in general. Therefore, it can be affirmed with reliability, that the phrases "Curse the Pope" and "The Pope is the Antichrist" are not authentic phrases of St. Kosmas, but were attributed to him by a forgery of Theodoret of Ioannina or someone associated with him, in an effort to promote his false teaching of two Antichrists.